Travelling with migraine is like signing up a for a voluntary torture session, which is why I’ve only been enduring it when I absolutely have to. Even with every trick and potion known to mankind, just the 5 minute car journey into town manages to make me feel spectacularly sick and triggers a stonking migraine that wipes me out for several days after. Any vehicle does it, bus, train or car. I always travelled better as a driver than as a passenger, so having to surrender my driving licence due to the migraine-associated vertigo back in January was a double blow. But then some conversations between my mum, my husband and an eco-friendly friend led to the revelation that there is such an invention as the adult trike, which might just solve the transport/balance issues. 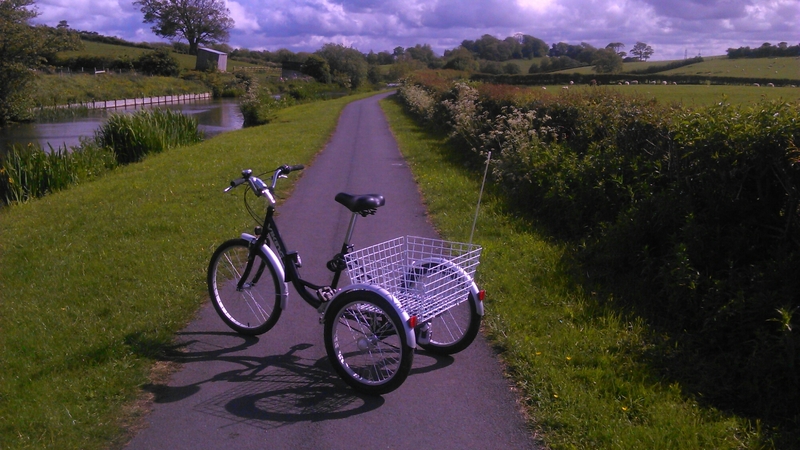 I’ve got some funny looks and it’s started a lot of conversations with random strangers but the trike, combined with our excellent local canal/cycle paths, has given me more freedom and independence than I’ve had in a very long time. I literally feel as excited as I did when I passed my driving test – I can’t even put into words how good it is to feel free after feeling trapped for so long, or how pleased I am to have made enough progress with the treatments to even consider riding the couple of miles into town and back. I’ve found my freedom again and it’s very, very good. Turns out there’s a solution to every problem if you think creatively enough! This entry was posted in My story and tagged creative, migraine, problem-solving, solution, travel, trike. Bookmark the permalink. Love this. If it works its worth the investment. Has time a bike. Bike riding together even if yours has an extra wheel could be abit more of a normal day trip out together. Lancaster canal is beautiful in the most part. with darker pubs along the way you could stop have lunch and peddle back. when im home id love to join you for lunch at one of the estabilishments you freakwent if you were feeling up for it and the trike riding is still working as not a trigger to worsening the migraines.